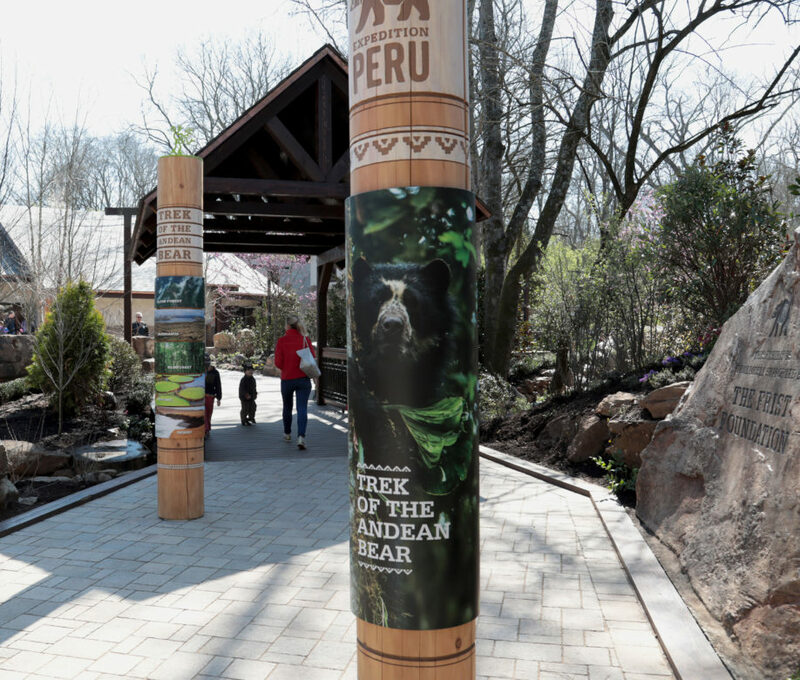 This multi species exhibit immerses visitors into a Peruvian village at the base of the Andes mountains where the elusive Andean bear calls home in the Cloud Forest. Through the architecture, exhibit design, and theming, visitors get a real feel for Peru – one of the most diverse places on the planet. 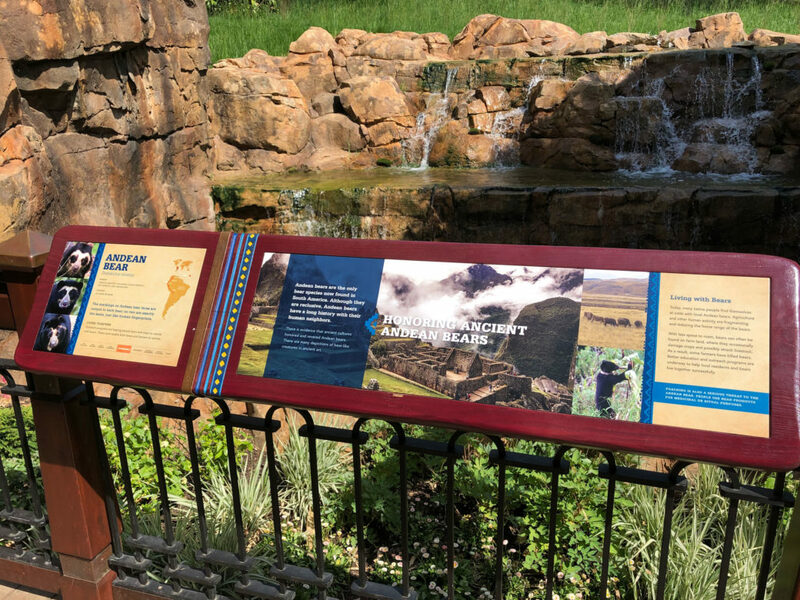 As visitors enter the exhibit through what appears to be stone ruins from long ago, they’re introduced to the diversity of species and habitats in Peru and its connection to the Andean bear. 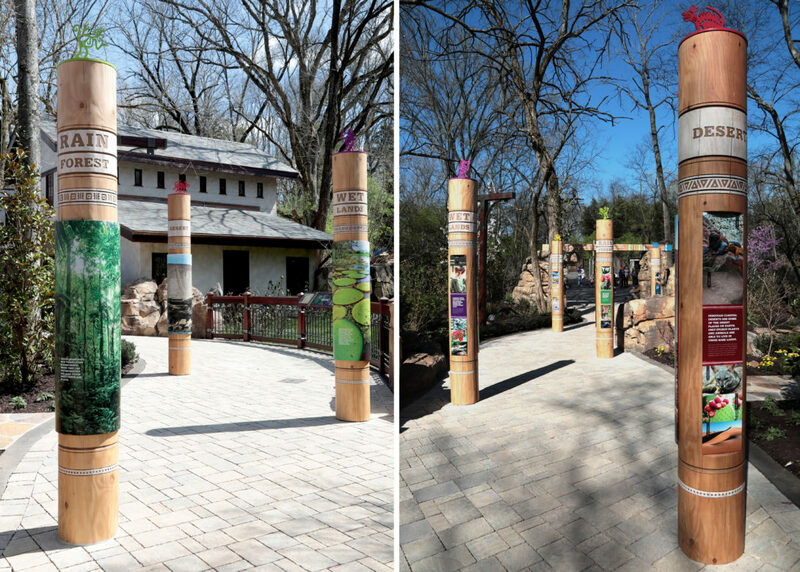 Large timber story poles feature curved content panels with colorful imagery and carved Peruvian influences. Each pole is 7 feet tall and 14 inches in diameter coming in at about 500 pounds each. 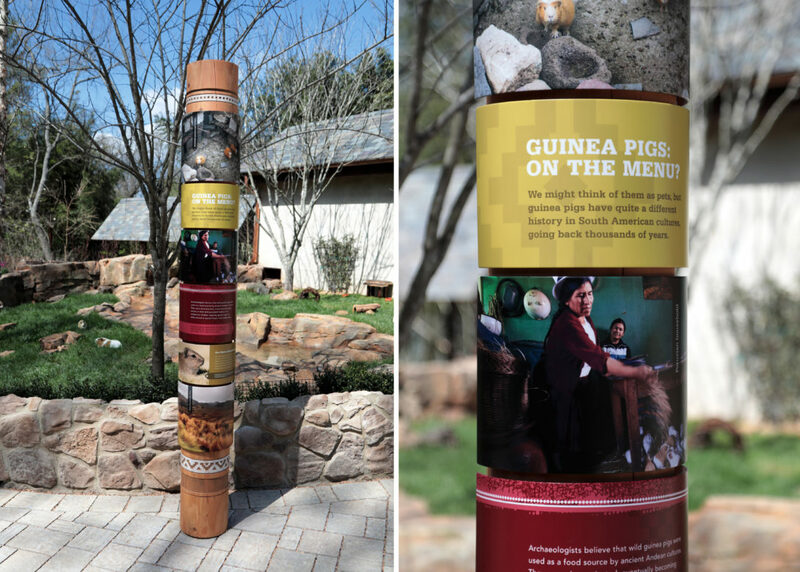 Visitors circulate in and around them like trees in a forest with interpretation on both sides highlighting different habitats and the residents that live there. 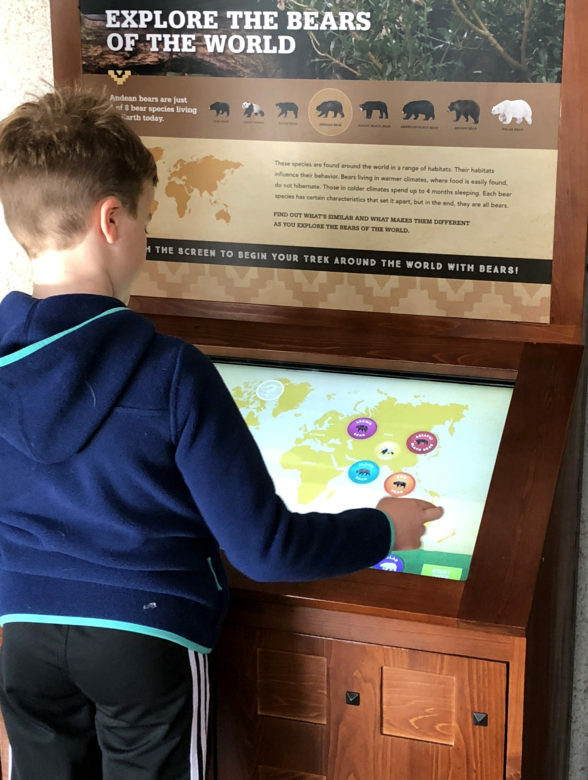 An interactive guinea pig wheel and bronze touchables also engage visitors as well as a touchscreen featuring two components – Bears of the World and a Bear Challenge quiz that asks visitors to match each bear with their home in the world. 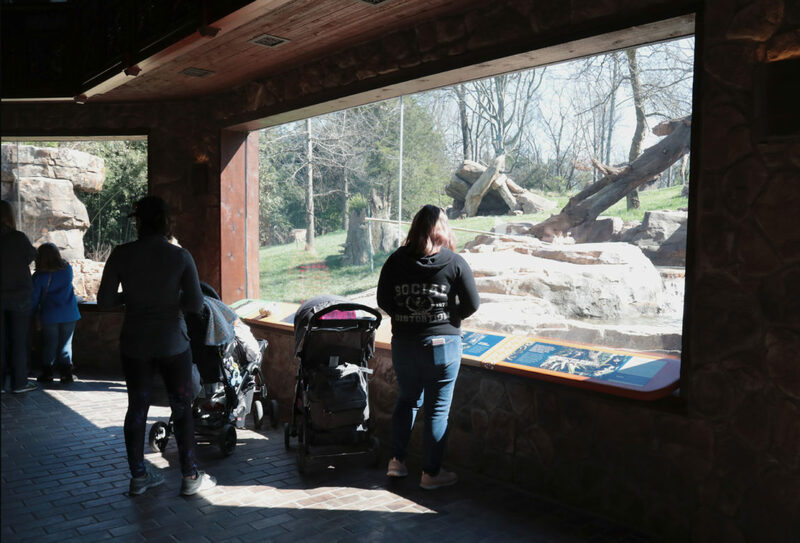 The Peruvian lodge is the centerpiece of the exhibit and offers sweeping views of the bear habitat as well as a multi species exhibit tank, featuring animals from the Amazon basin such as lizards, turtles, fish and stingrays. 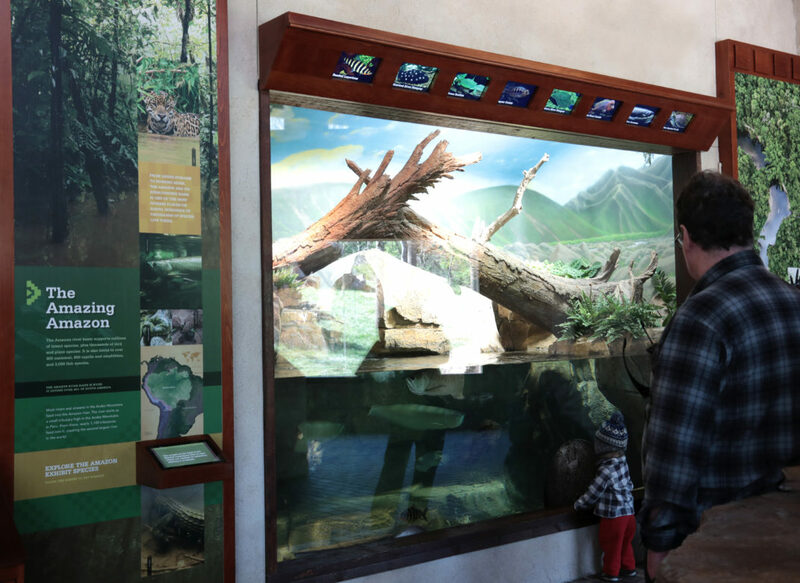 To identify the animals in the tank and allow for changing species we integrated digital displays into the exhibitry as well as a touch pad for visitors to learn more about each species. 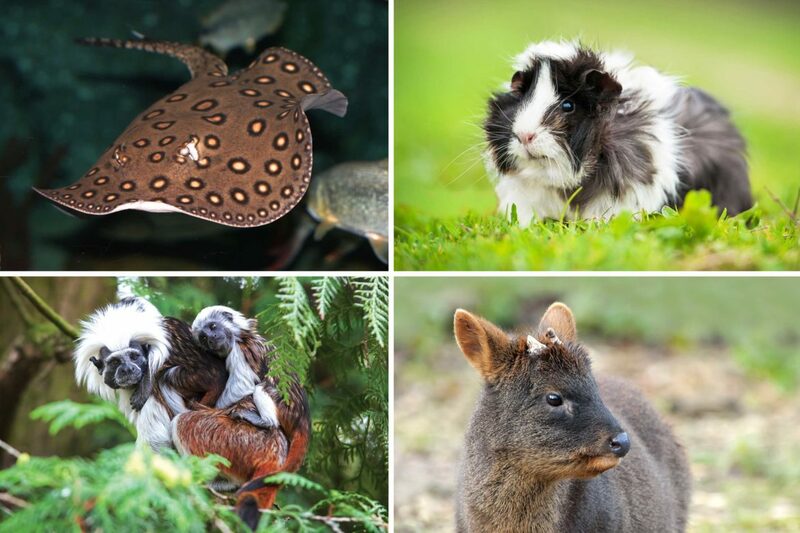 Pudu and Guinea pigs are also featured outside the lodge as well as a surprise primate in the women’s restroom with floor to ceiling viewing of the Cottontop Tamarin. Custom reader rails of wood and copper with embedded graphic panels are incorporated into the detailed viewing rails. 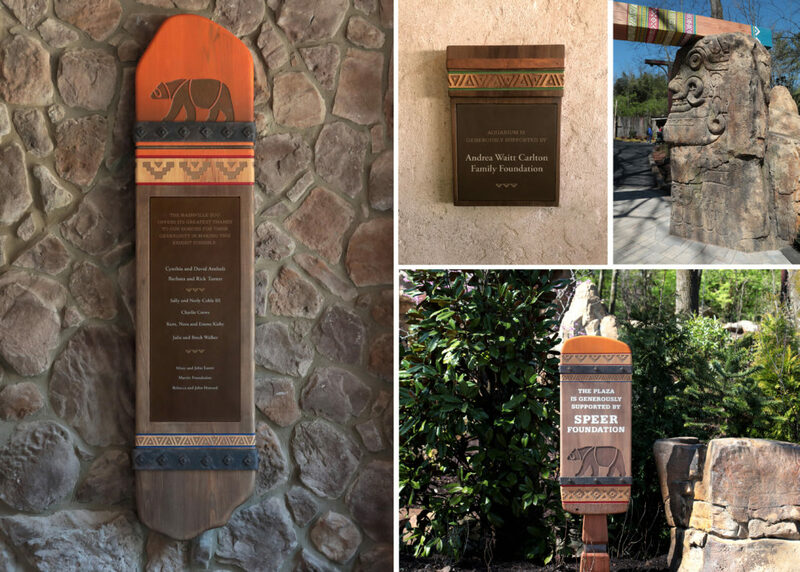 Gecko Group also created a donor program with unique signage and sculpture for higher level donors as well as themed restroom and code signage. The exhibit opened in March of this year to great fan fare from visitors. 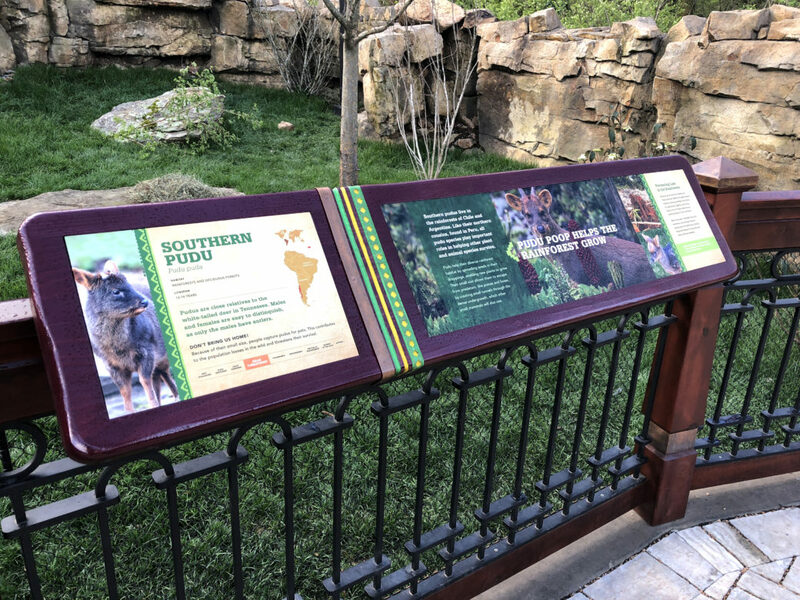 This is just one of many exhibit projects Gecko Group has designed and developed with the Zoo and we continue to partner with the Zoo in creating beautifully designed immersive experiences. Next up is the Sumatran Tiger exhibit scheduled to open in 2018. 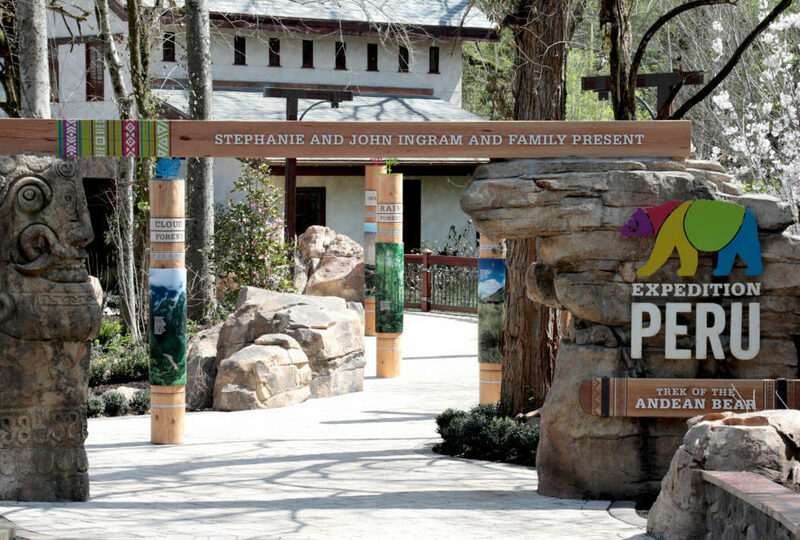 Jack Hanna boasts the Nashville Zoo to be one of the top 5 Zoos he’s been to in the country! “I’ve been walking the zoo for two days now, and I’m not just saying this everyone, this is one of the top five zoos in the country, easy. I’ve been to just about every zoo in the country and zoos all over the world. This thing is absolutely beyond a jewel. 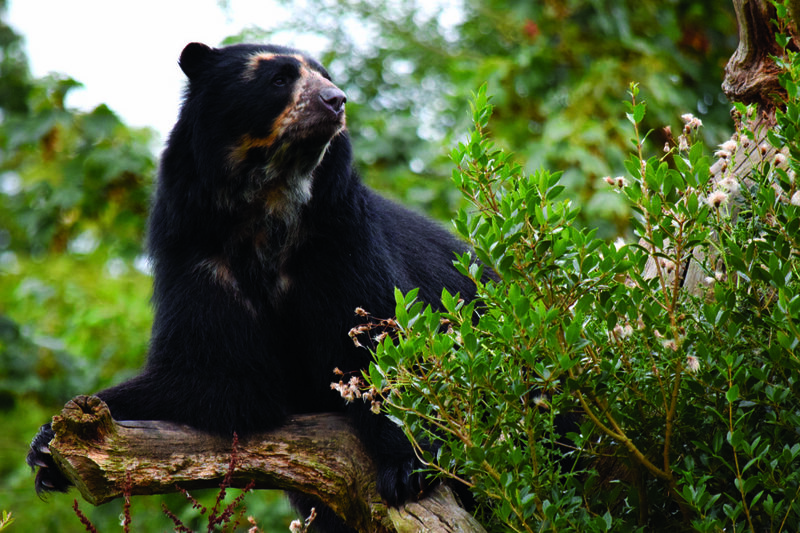 The new one with the Andean bears is spectacular. I had dinner right in front of them last night. I just couldn’t believe. The tables there, couldn’t believe what was behind those glass windows. People would pay I don’t know how much money to have dinner there, lunch there, anything there, much less the animals behind you. Again, the way they landscaped that one, it looks like it’s been there for 500 years, and again it just opened,” added Hanna. The exhibit features multiple educational interactives. 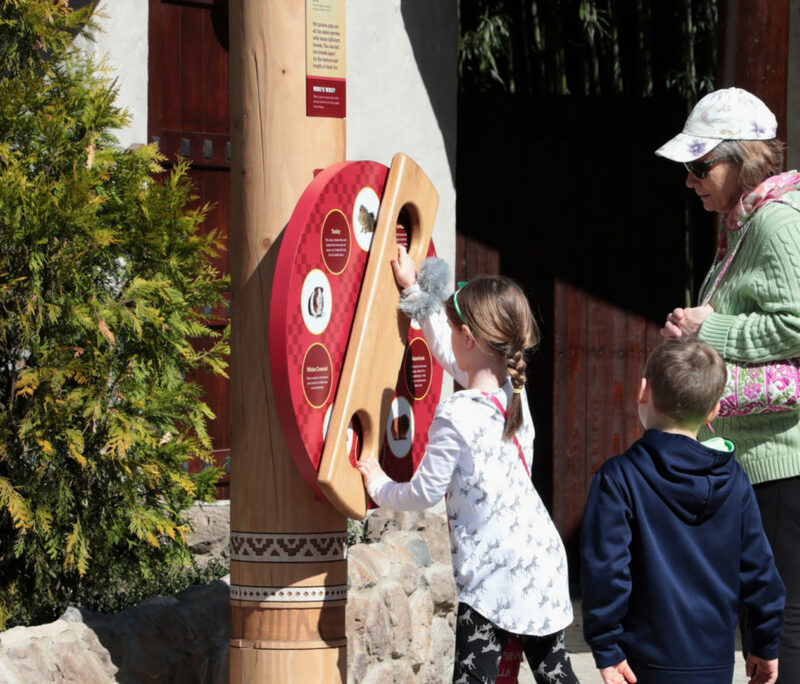 An interactive guinea pig wheel and bronze touchables engage visitors as well as a touchscreen featuring two components – Bears of the World and a Bear Challenge quiz that asks visitors to match each bear with their home in the world.